Last year we collaborated with the Possible Futures Lab of the Information Security Group at Royal Holloway University of London to assist local people in Pallion, Sunderland develop a way to come together and help each other map out the skills, knowledges, resources and capabilities for responding to and effecting change in their community. The outcome of this was the establishment of a regular group of people working out of the community centre Pallion Action Group. As part of our work with them we co-designed a series of simple ‘tools’ that could be used to help them do things like identify problem and solutions and share them online confidently and safely. To make these tools available to anyone for use in their own communities, we have now designed generic versions and collected them into a Neighbourhood Ideas Exchange Toolkit. The toolkit is free to download and everything in it is free to adopt and adapt under a Creative Commons Attribution Non-commercial Share-Alike license. We would love to hear of anyone’s experiences using or adapting these tools for their own purposes and keen to hear of suggestions for improvements or additions to the toolkit. One of the items we feel is currently missing is some form of simple self-evaluation tool for communities to use to determine how successful (or not) they are in achieving their aims and objectives. We are also working on a special set of StoryCubes designed to help both organisers and communities work through common issues and to devise solutions and activities that help them set up their own Neighbourhood Ideas Exchange. Where possible (time and resources permitting) we are willing to develop new or customised versions of specific tools, such as the notebooks or worksheets. Please get in touch with us to discuss your ideas or suggestions. Neighbourhood Ideas Exchange by Proboscis is licensed under a Creative Commons Attribution-NonCommercial-ShareAlike 3.0 Unported License. Hello, Haz here. I’ve been asked by Giles and Alice to write about my first impressions of Proboscis and my experience of working here as a Creative Assistant for the last fortnight, under the Future Job Funds placement scheme. I was fortunate enough to get a placement just as the scheme was ending, and it’s a welcome opportunity after an otherwise unproductive year for me, an opportunity where creativity is a crucial part of my role, and something to be celebrated, rather than suppressed, as in previous job experiences. As would be the case for many other young people in Future Job Fund placements like this, I have no prior education or experience in the arts, only a recreational passion. Any initial trepidation has been eased by the focus on existing strengths and interests (for me, literary) and a comfortable, relaxed environment to get familiar with Bookleteer, by creating eBooks and StoryCubes of my own. 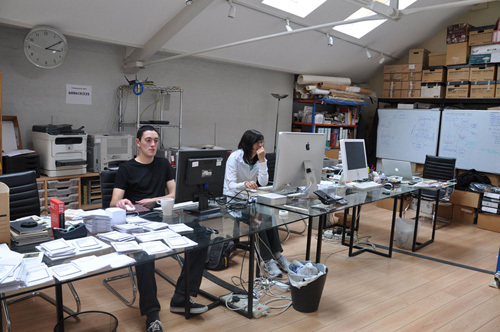 The studio, and the surrounding architecture of Clerkenwell, with its rich history, is inspiring. This was the basis for my first StoryCube, a simple photocube of historic buildings. Simple, because my initial idea, a 3D model of Smithfield market made using multiple StoryCubes, was a tad too ambitious for my first attempt, alas. My eBook was a very slight portfolio of poems, which led me to start thinking about how Bookleteer could be a useful tool when creating zines (small circulation publications) and inspiring people to create their own through its simplicity. I’ll be exploring this during my time at Proboscis and sharing any interesting ideas and creations I’ve found from the zine scene on the Bookleteer blog, hopefully even attending some zine fair’s with a on-site Bookleteer workshop and writing about the experience. Neighbourhood radio is a project aimed at opening lines of communication amongst neighbours and form community connections by breaking down social distance and barriers. New digital media and online culture is now widely accepted as the norm however it is still restricted by on age and price. Analogue radio use spans generations and affluence, making it the perfect medium to bridge these gaps. In this digital age, radio is fast becoming old media. Considering the changes that have happened to broadcasting over the recent years, such as digital and satellite communications, it’s important to look at the way we use older technologies and re-evaluate their purposes. The every expanding digital presence has also heralded the way for new communication ideologies. Open source and hacktivist culture was born out of a global information gift economy, made possible through internet connection. This has given power to the people, creating a social need to make, repurpose and share technology. This project seeks to repurpose current technologies to make them more socially relevant and to do so through an open source, easy to use model. Radio is also a highly regulated system and to challenge this would deservingly called into question broadcast laws opening the way for new creative thinking and activity within the medium. I undertook research into how Proboscis might create an online/off line ‘radio’ station as part of professional development commission. The commission was a way of me working with Proboscis in a professional manner to enable me to develop my individual artistic practice and freelance work as a recent graduate. This project has helped me understand the depth of research required before undertaking artistic interaction design projects as a part of a functioning arts company. It has led me to develop my freelance work and helped me understand project management in the arts world. I have also been able to advance my understanding of technology, leading me to courses in programming to help me further my understanding of this subject area. I hope to develop the project into a working prototype with the help of the Proboscis team and technology partners as I believe the project would be of great social benefit to community projects.